A much wanted update has arrived to the Companion Database: new format to companion pages! The Epic Talent, Powers and Abilities box on each page has been updated to a new improved version, with thanks to Legends from Legends of the Spiral. Go take a look for yourself today! 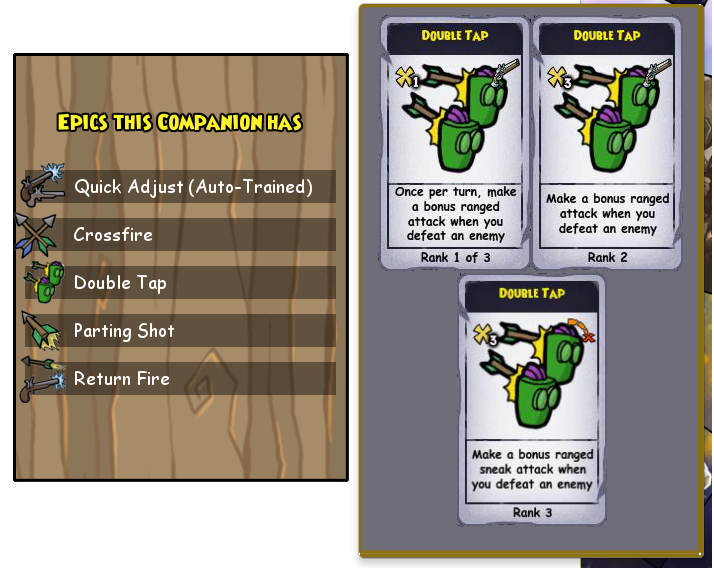 Adding this new format allows us to give you a better idea of what companions can actually train. We will continue to modify this feature, particularly by indicating which companions can train rank 3 Epics, in the future. A new format to the Basic Information located at the top of a Companion Page will be updated in due course. As a result of this update, the Promotion Quest Buttons have been removed from the posts for the time being. The new Abilities that contribute effects to Companion Orders have been added in preparation for the Test Realm going Live. When you hover over a power, you will get all variants of this power (Rank 1, 2 and 3 or the upgrade of it) this is so the box was not cluttered. Generally, (except from Nausica) the Powers are replaced by their upgraded version. The Epic, Power and Ability Pages will be updated as well, but this is an update we can bring without taking down the Database.